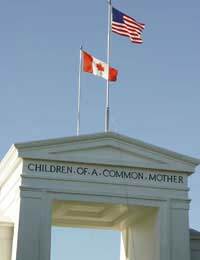 A gap year in Canada or the USA is a guaranteed adventure. The saying goes that everything is bigger over there - the houses, the cars, the food - and the same goes for fun! Whether you want to bike cross-country, work at a summer camp or learn how to fly, you can find all of these opportunities and more during a gap year in the US or Canada. North America is the third largest continent in terms of size, and covers almost 5% of the Earth's surface. Like Europe, definitions of the countries and territories that make up North America vary, but of any North American countries, the USA and Canada are by far the largest. The climates across the United States and Canada vary considerably, from tropical to arctic, so prepare for any eventuality. Clothing and shoe sizes run differently in the US and Canada, so make sure to pack sturdy walking shoes, boots, and/or sandals, raincoat or all-weather coat, hat and gloves, comfortable layers of clothing, swimsuits and a comfortable backpack to put it all in. When your bags are packed, you need to investigate and arrange travel vaccinations recommended by your GP or local clinic once you have these you should register for travel insurance. Before you leave obtaining travel and medical insurance claims forms - should the worst happen you will be prepared to make your claim as soon as possible. Make sure you have all the prescribed medicine that you will need for your trip. When travelling to the USA or Canada you will need to apply for a visa, however you will only need to do this if you are planning to stay for longer than 90 days, or you are planning to work or study while in the country. Check with the Foreign and Commonwealth Office for travel advisories and keep abreast of local news in the areas you plan to visit. International Student Identity Card (ISIC) - must be a student. International Youth Travel Card (IYTC) - must be under 26 years of age. Youth Hostel Association - cheapest if you are under 26 years of age. An itinerary is a great way to create an efficient travel plan. Leave a copy of your itinerary with a family member and register with the local Embassy or High Commission in case of emergencies. If you are planning a gap year in the United States and/or Canada, then there is an unbelievable amount to see and do some of the most popular activities include; The Freedom Trail in Boston, the Empire State Building, Statue of Liberty and Ellis Island in New York, the White House, Capitol and Lincoln Memorial in Washington, D.C. the Alamo in San Antonio, Texas, the Grand Canyon National Park in Arizona, the bright lights and slot machines of Las Vegas and many, many more! Use the internet and an American guidebook to plan your route and adventures. Another way to experience Canada and the United States is to join a structured work, study or volunteer programme. The United States and Canada do experience random crime, so use common sense to stay safe. Keep your valuables locked at your hotel or hostel and keep your wallet/purse on your person at all times. Do not wander in deserted areas alone, and stick to well lit avenues. Never watch bags or carry items for strangers and alert authorities to suspicious behaviour. If anyone is looking for a nanny in Ontario i would be more than happy to set something up. I currently live in Australia and im studying towards my diploma in chilrens services. I Will be travelling over to the USA next year (2012) looking for a full time nannying job.